Thousands celebrated the Sikh new year in one of Canada's largest annual parades. Photo by <a href="https://www.flickr.com/photos/[email protected]/16659742264/">Greg's Southern Ontario</a> from the <a href="http://www.flickr.com/groups/torontoist">Torontoist Flickr Pool</a>. Photo by Greg’s Southern Ontario from the Torontoist Flickr Pool. Photo by <a href="https://www.flickr.com/photos/[email protected]/17256181156/">Greg's Southern Ontario</a> from the <a href="http://www.flickr.com/groups/torontoist">Torontoist Flickr Pool</a>. Photo by <a href="https://www.flickr.com/photos/[email protected]/17285393142/">Greg's Souther Ontario</a> from the <a href="http://www.flickr.com/groups/torontoist">Torontoist Flickr Pool</a>. Photo by Greg’s Souther Ontario from the Torontoist Flickr Pool. Photo by <a href="https://www.flickr.com/photos/[email protected]/17256103726/">Greg's Southern Ontario</a> from the <a href="http://www.flickr.com/groups/torontoist">Torontoist Flickr Pool</a>. Photo by <a href="https://www.flickr.com/photos/[email protected]/16661806263/">Greg's Southern Ontario</a> from the <a href="http://www.flickr.com/groups/torontoist">Torontoist Flickr Pool</a>. Photo by <a href="https://www.flickr.com/photos/[email protected]/17094276678/">Greg's Southern Ontario</a> from the <a href="http://www.flickr.com/groups/torontoist">Torontoist Flickr Pool</a>. 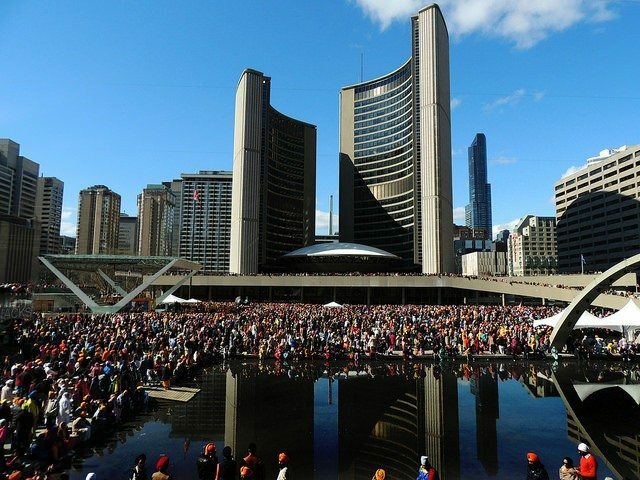 WHEN: Sunday, April 26, 3:00 p.m.
WHAT: The Khalsa Day Parade made its way from the CNE grounds to City Hall as thousands of Sikhs celebrated the new year in one of Canada’s largest annual parades. Nathan Phillips Square teemed with celebrants, and some couldn’t be bothered to elbow their way through the crowds and so instead walked through the reflecting pool, which was filled with a shallow amount of water. Former police chief Bill Blair, who recently announced his intention to run for the Liberals in Scarborough-Southwest, showed up to join the festivities, and wore a turban too.